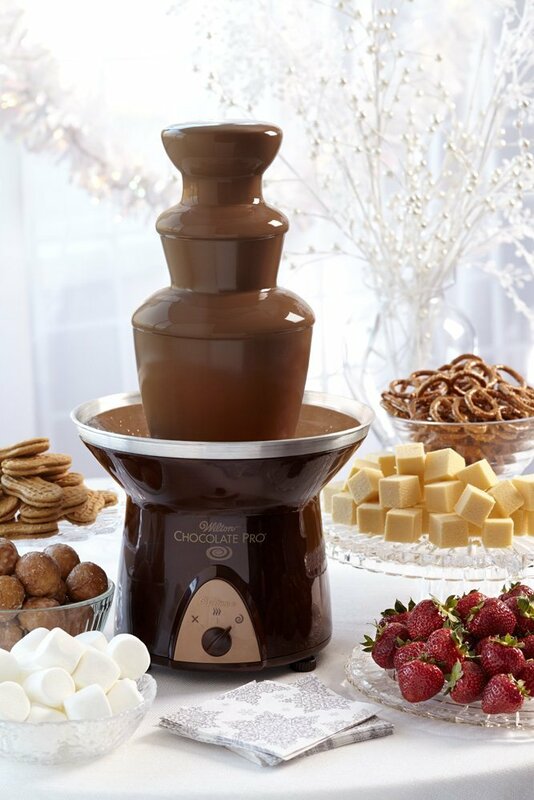 A chocolate fountain is a wonderful addition to every special occasion. Who doesn’t love the delicious temptation and the interactive nature of this appliance? If you’re using a chocolate fountain for the first time, however, you may have some questions about it. The most common inquiry is about the type of chocolate to use with the fountain. Are there any specifics and recipes to keep in mind? The following guide will acquaint you with the basics. You can experiment with different varieties of chocolate until you identify the ones that are most suitable for use in a fountain. The problem with most types of chocolate is that it simply doesn’t have the consistency. Chocolate for a fountain has to be a bit runnier in order to create the flowing effect. The best chocolate fountains usually come with recipes and instructions about getting the right thickness. In essence, you’ll be recommended to add some oil to the chocolate. There’s no reason to worry about ruining it – the oil can’t be tested and the guests will enjoy tons of cocoa deliciousness. If the fountain you buy doesn’t come with instructions, consider trying one of the following recipes. They will guarantee a perfect texture every single time. The ingredients you’ll need include half a cup of vegetable oil per one pound of chocolate. Melt the chocolate in your microwave or in a double boiler. If you opt for a double boiler, still to make sure that the chocolate has liquefied thoroughly. When the chocolate is fully-melted, start adding the oil gradually. Don’t dump it all inside – stir and keep on adding to make sure you’re getting a homogenous mixture. By stirring all the time, you’ll also get to determine when the chocolate has reached the right thickness. If the mixture begins solidifying, you may want to return it to the microwave or get the double boiler heated once again. When done, transfer the chocolate to the fountain and turn it on. Dip a fondue fork into the fountain to test the thickness of the chocolate. If you’re happy with the result, you’re ready to get the party started. Alternatively, you may want to use chocolate tablets. The amount will depend on the size of the fountain you’ve gotten. Go through the instructions to make sure you’ve melted the right amount. Don’t feel like going through the procedure? In this case, consider buying pre-mixed chocolate that’s ready for use in a fountain. This chocolate variety doesn’t require tempering or any additional work. All of the ingredients are chosen carefully by the manufacturer, which means you’re running no risk of getting the chocolate ruined by adding too much (or the wrong kind of oil) to it. Pre-mixed chocolate will only have to be melted in your microwave or a double boiler before getting added to the fountain. Though this product may be a bit more expensive than mixing your own chocolate, it will save you time and reduce the risk of ruining the whole thing. Melt the two types of chocolate together. If you’re using pre-mixed chocolate for a fountain, move on to adding the other ingredients. The whipping cream will change the consistency but if you’re using regular chocolate, you’ll need to put some oil in. The almonds need to be very finely chopped – put some effort in this process. Stir all of the ingredients together. Test the thickness of the chocolate sauce and if you’re happy with it, transfer to the fountain. You can also experiment with other recipes and sauces. The three chocolate varieties – dark, milk and white have a specific taste of their own. By adding a couple of other ingredients to these basics, you can create gourmet experiences for all of the party guests.